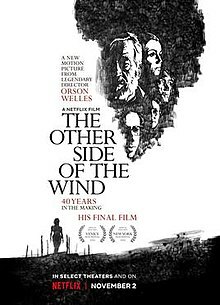 EYG Hall of Famer Orson Welles’ final film, a film that had been locked away, mostly completed, for 40 years, has finally been released on Netflix. And it is some kind of movie. The story of how the film came to be is almost more of a tale than The Other Side of the Wind. I would certainly recommend that if you plan on watching this movie, you take the time to watch the documentary, They’ll Love Me When I’m Dead as well. It makes for a very important companion piece to this movie. The Other Side of the Wind is about a legendary film director who had been self-exiled to Europe for years, returning to Hollywood to get his final passion project filmed. The narrative of this movie is told through two lenses. One, the struggles of the director, Jake Hannaford (John Huston), trying to get through the filming with money troubles, struggles with actors and with the Hollywood machine. Two, the film that he has made is used as a “film within a film” and helps to show the artistry and the imagination of Hannaford. Now, many people assume that the film is basically an autobiographical tale of Orson Welles himself. Welles had denied this, but it does seem to be pretty obvious that the character of Jake Hannaford is based strictly on the director. Apparently there were some scenes of the nearly completed film that were damaged and had to be replaced with photos and voice over. These scenes feel as if they would have been important for the conclusion of the movie unfortunately. Of course there is no way around that and what they did with those scenes is the best they were going to be able to accomplish. There are so many truly visionary shots in this film that you could break down countless numbers of them for analysis. The scenes fly fast and furiously through the film and you are never allowed to linger on anything for long. It is certainly an impressive feat of film-making and the creative process. It changes perspectives, black and white to color, and points of view as easily as you can imagine. It is slight on story and may be too inside Hollywood to truly reach a wide audience. John Huston is tremendous here as Jake and the relationship between him and Peter Bogdanovich’s character, Brooks Otterlake, is compelling. While Welles never put together the ultimate final cut of this movie, those who did paid tribute to his overall vision and presented the world with a film about moviemaking that is chaotic, wild, jubilant and full of the proper amount of satire. This feels like an appropriate end to a legendary career.